23 April - 30 September. Directly on Faakersee, Camping Arneitz is one of the best sites in this area, central for the attractions of the region, watersports and walking. 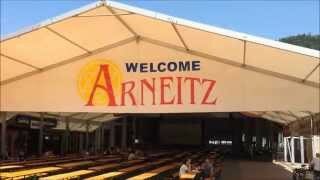 Family run, Arneitz leads the way with good quality and comprehensive facilities. A newly built reception building at the entrance reflects the quality of the site and, separate from reception facilities, has a good collection of tourist literature and two desks with computers for guests to use. The 420 level, marked pitches are mainly of gravel, off hard roads, all with 16A electricity, TV, water and waste water connections. Some have good shade from mature trees. There is a delightfully appointed restaurant at the entrance where there is entertainment in high season. Day trips can be made to Venice and many other parts of northern Italy, and the surrounding countryside. Splendid family washroom, large, heated and airy, with family cubicles around the walls and in the centre, washbasins at child height in a circle with a working carousel in the middle. Extra, small toilet block nearer the lake. Laundry facilities. Motorhome services. Supermarket. Self-service restaurant, bar and terrace. General room with TV. Small cinema for children’s films. Beauty salon. Well equipped indoor playground. Fishing. Dogs are not accepted in July/Aug. WiFi throughout (charged). Site is southeast of Villach, southwest of Velden. Follow signs for Faakersee and Egg rather than for Faak village. From A11 take exit 3 and head towards Egg, turn left at T-junction and go through Egg village. Just after leaving village, site is on right.